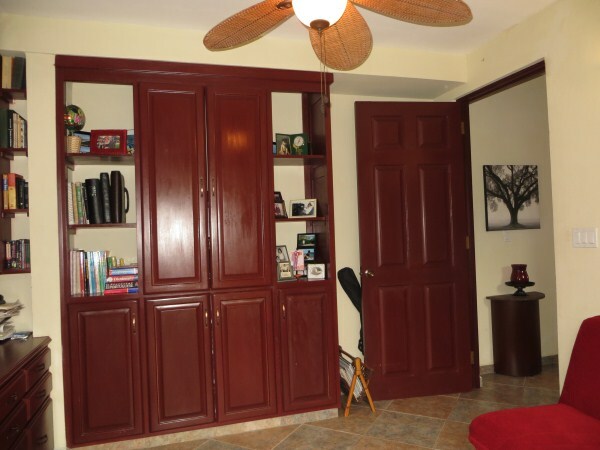 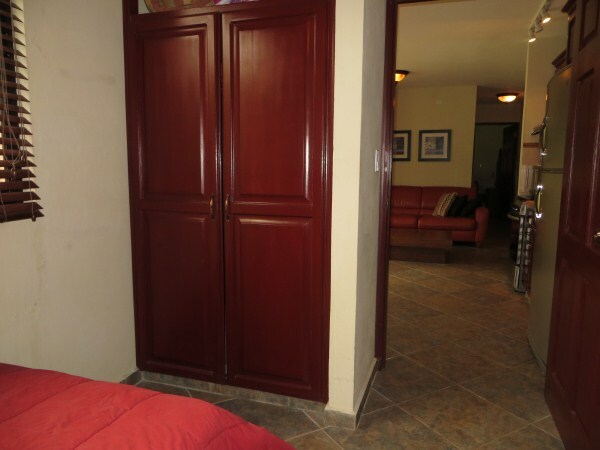 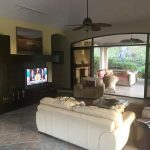 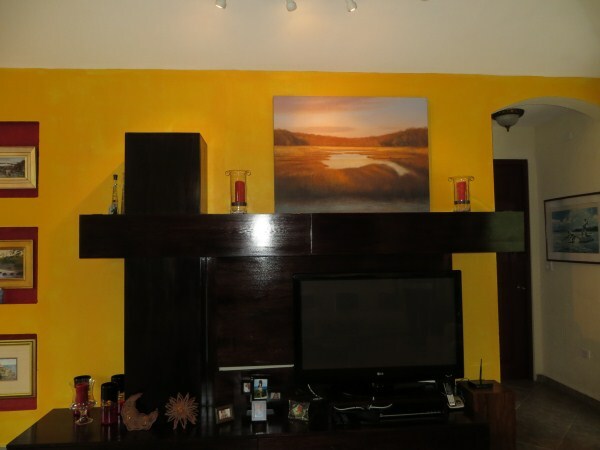 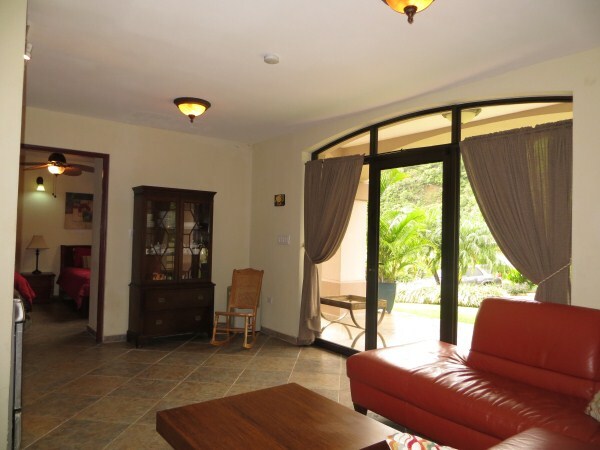 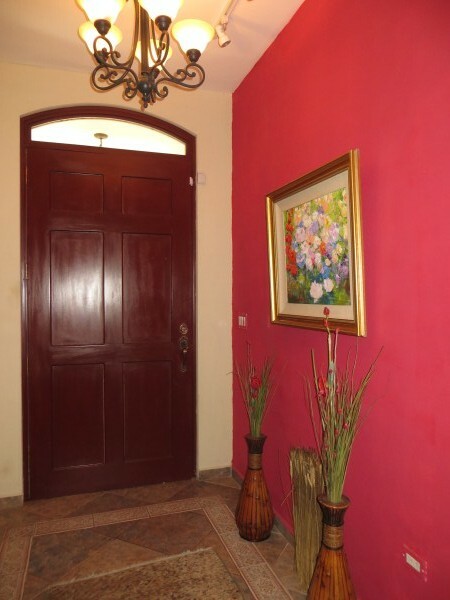 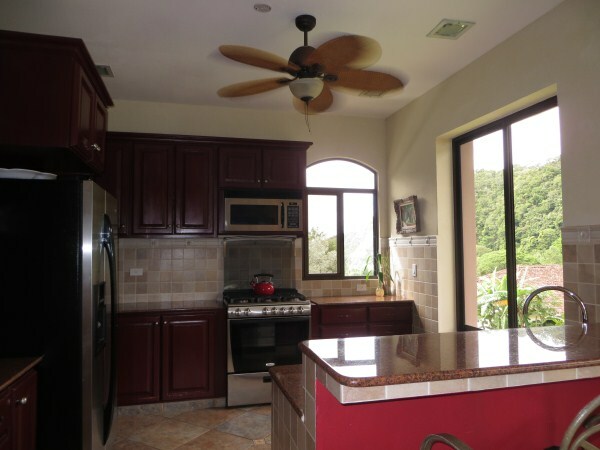 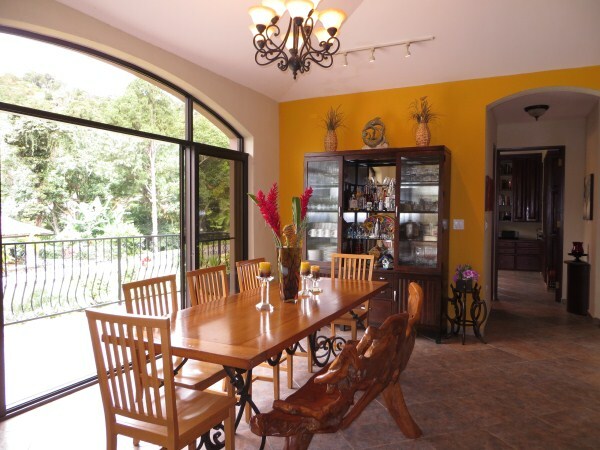 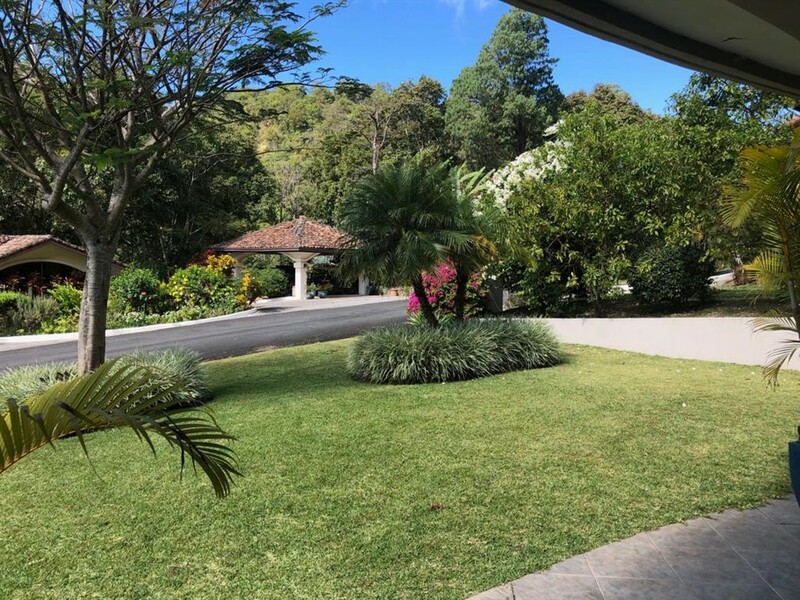 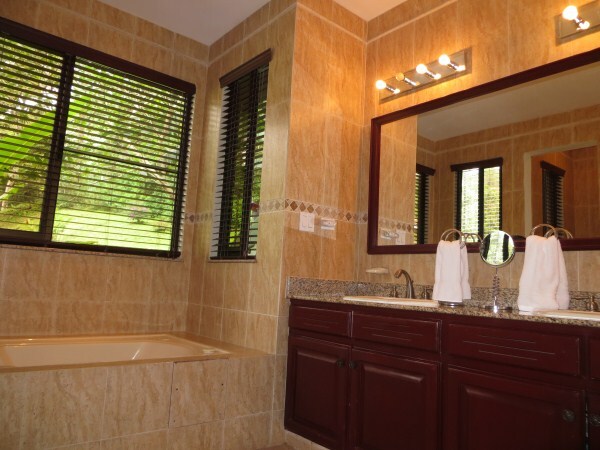 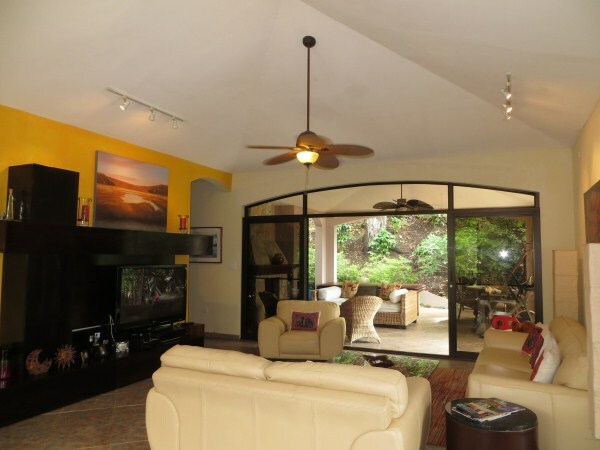 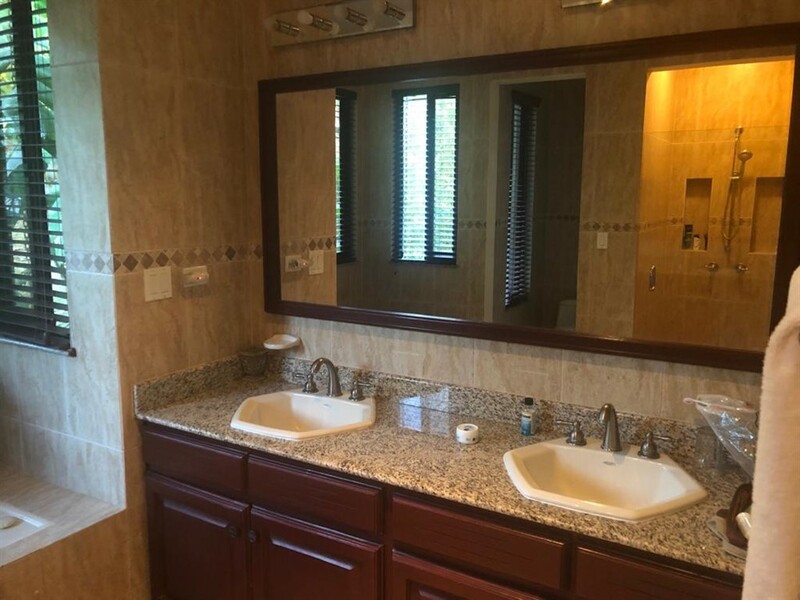 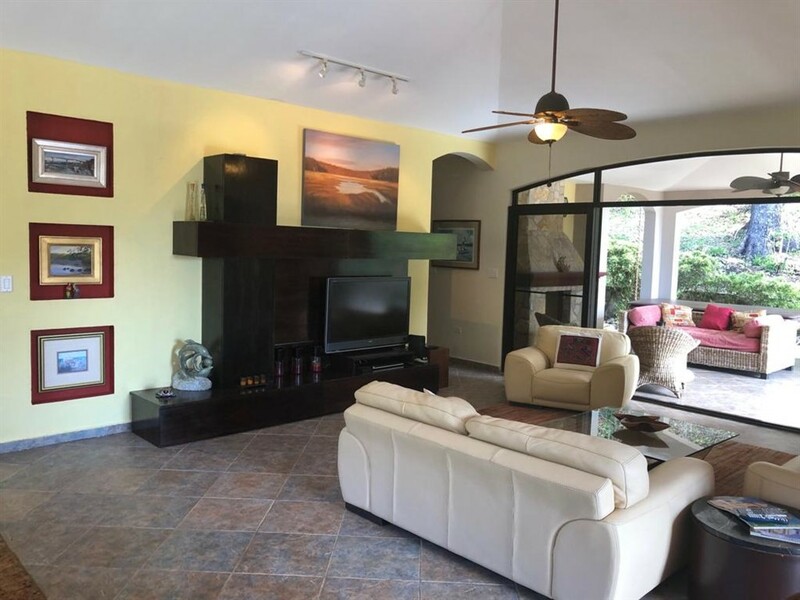 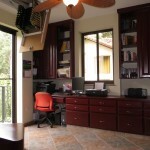 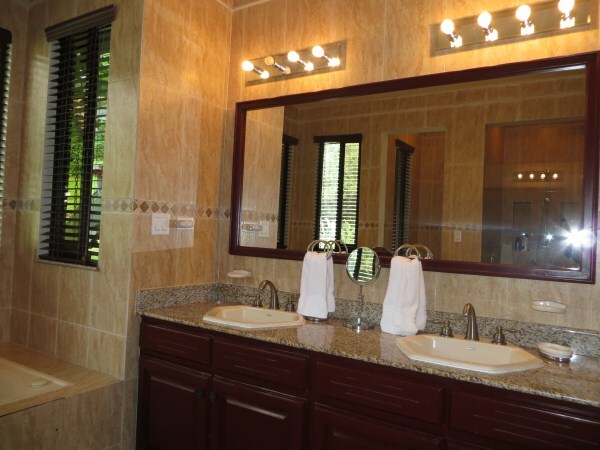 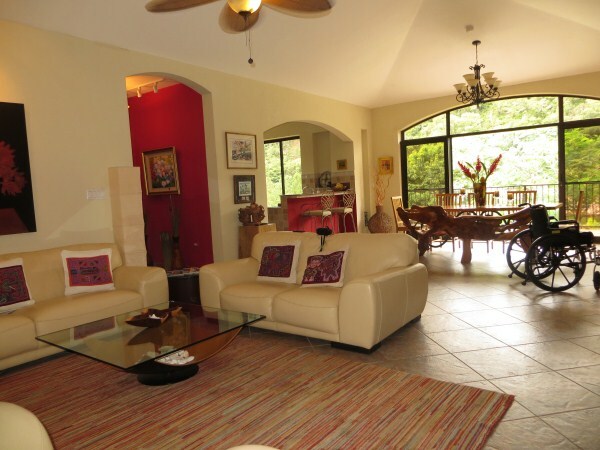 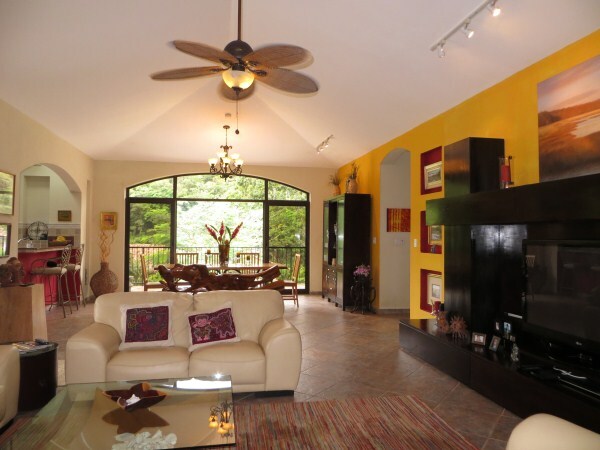 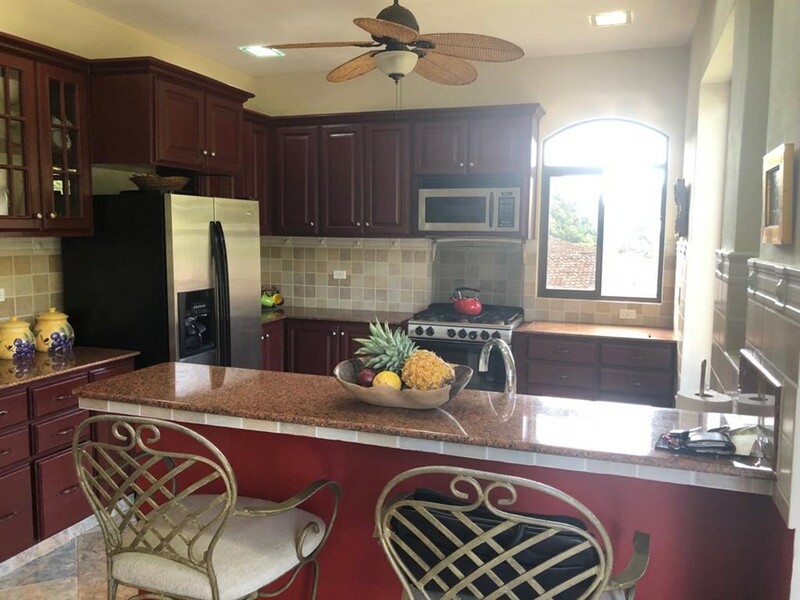 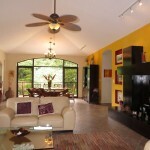 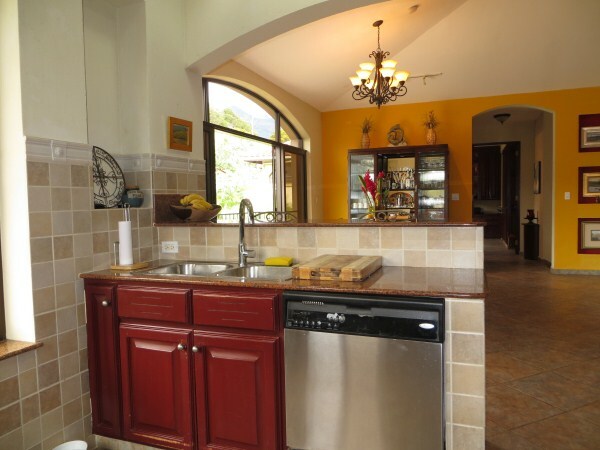 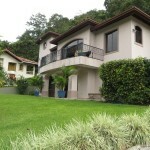 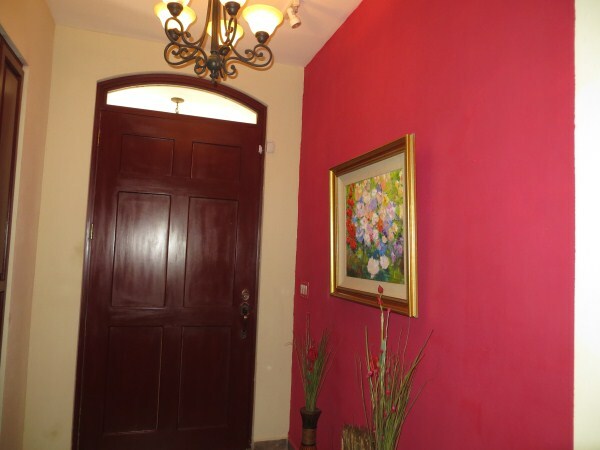 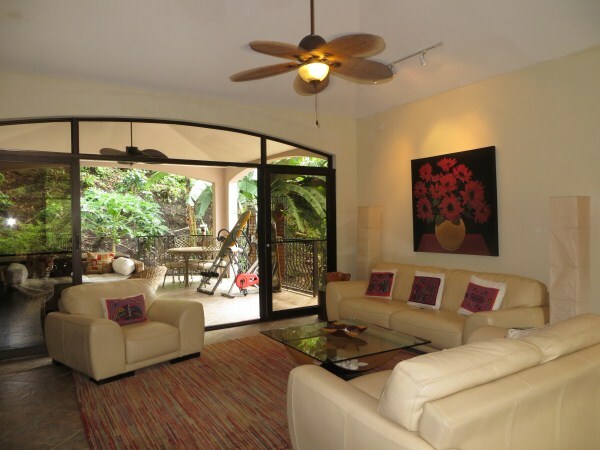 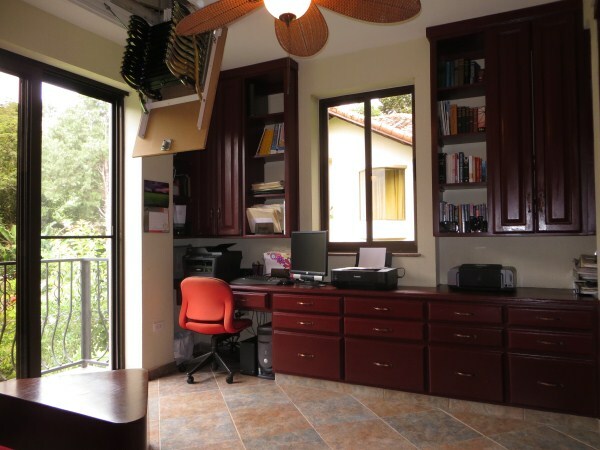 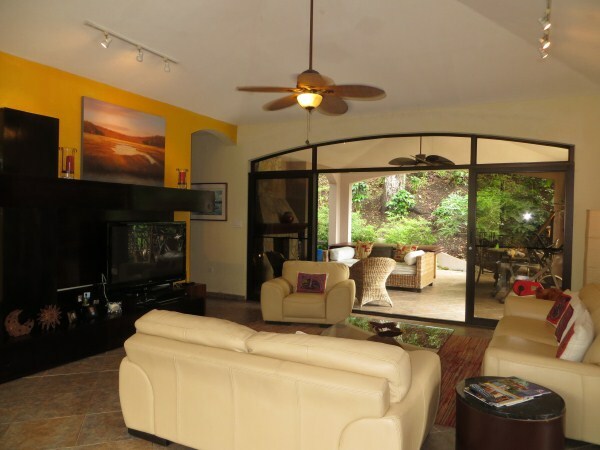 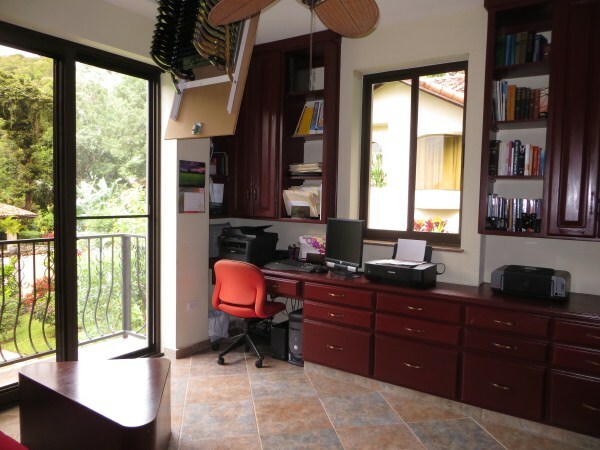 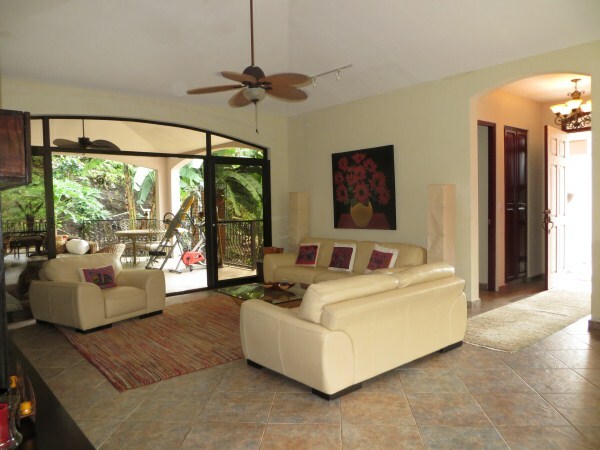 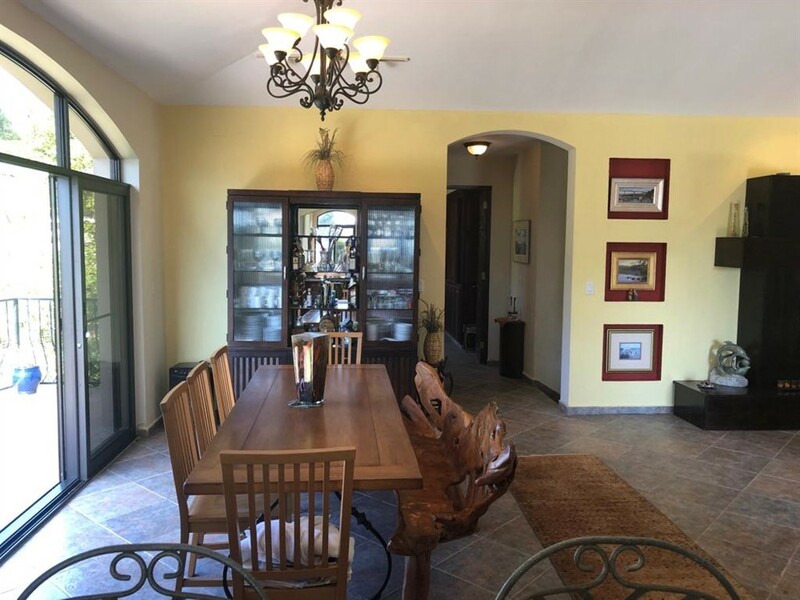 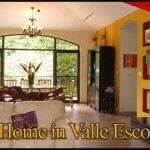 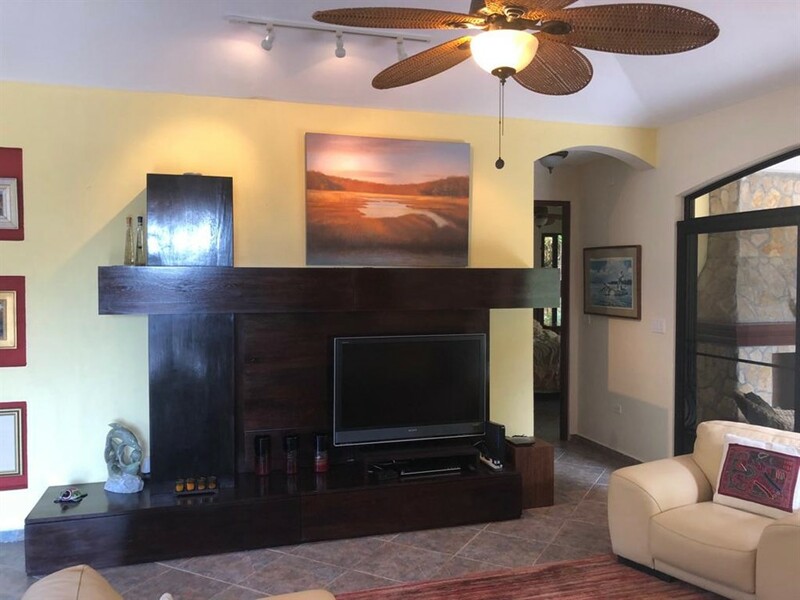 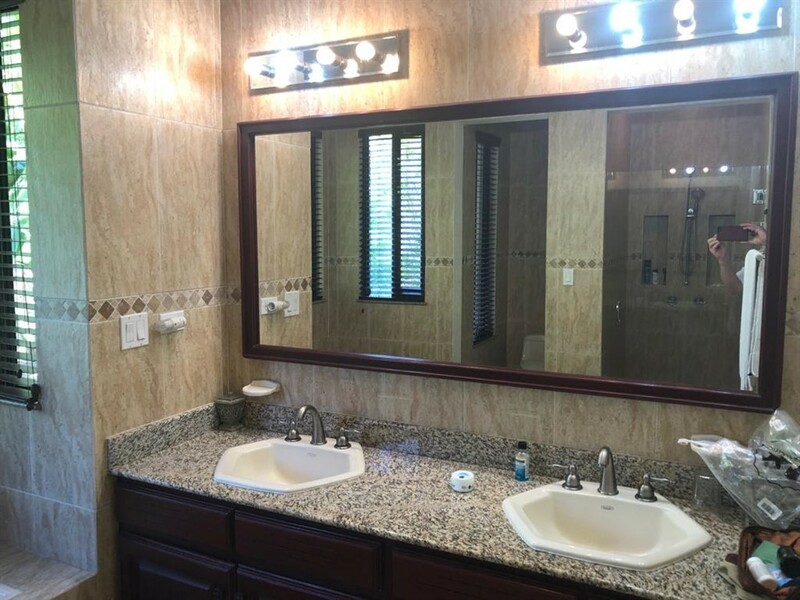 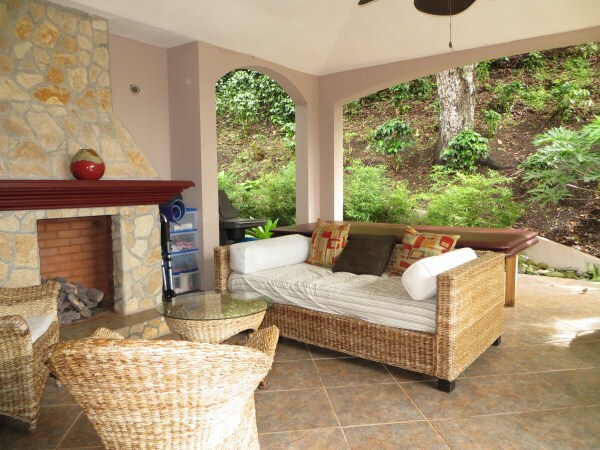 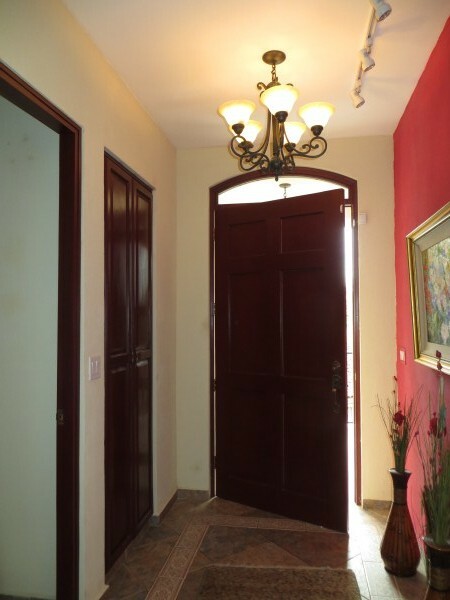 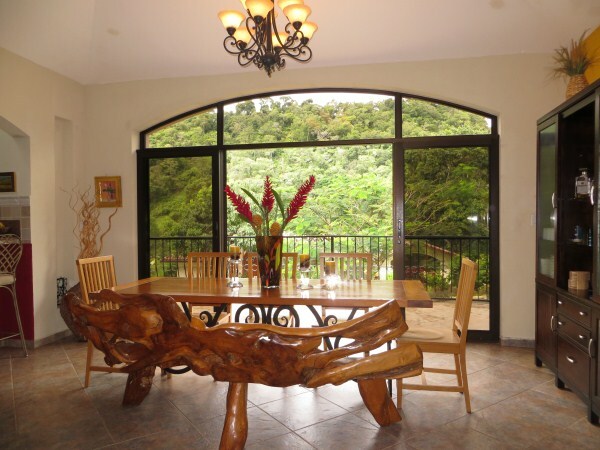 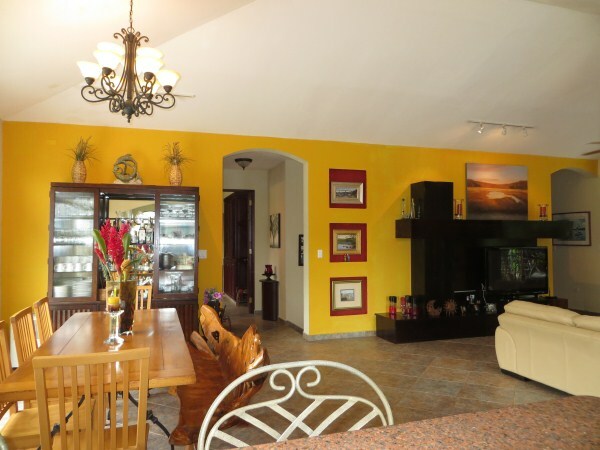 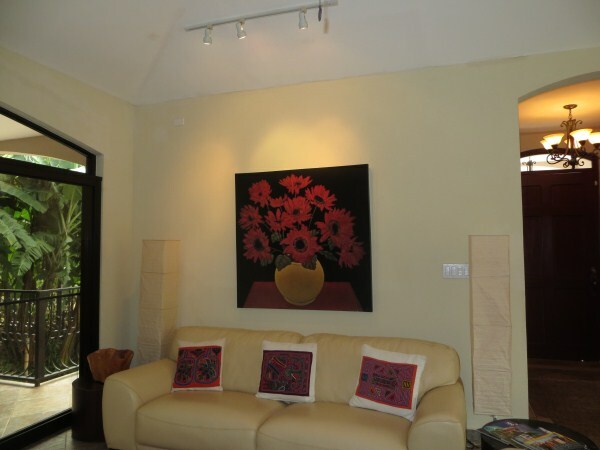 Enjoy your new life in this high quality free-standing home in Valle Escondido, Boquete’s famed gated community. 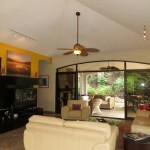 The open floor plan house is in excellent condition and well located amidst high-end homes on a lovely street. 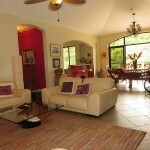 It is impressive with the primary living spaces all together on one floor. 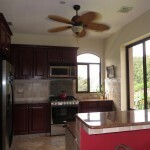 The living room, kitchen, laundry room, master bedroom and guest bedroom/office are all on the higher level. 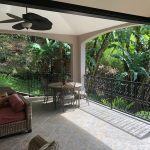 Just off the living room is a veranda with gas fireplace in a very private backyard setting. 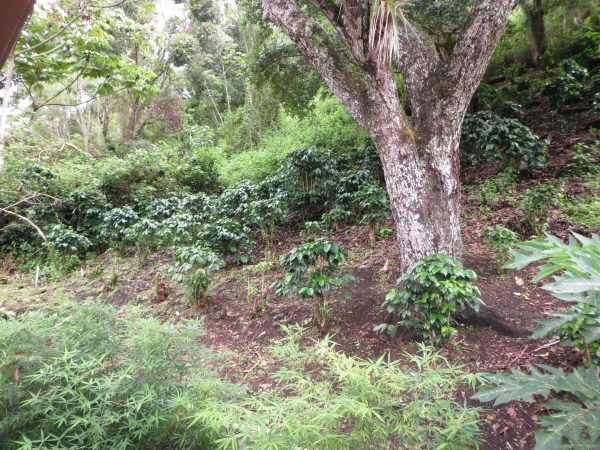 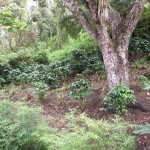 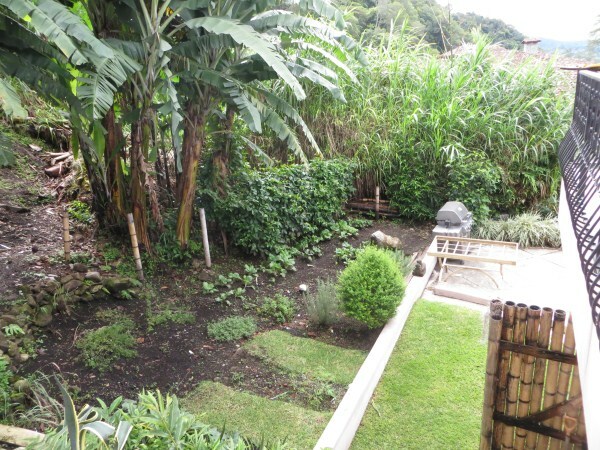 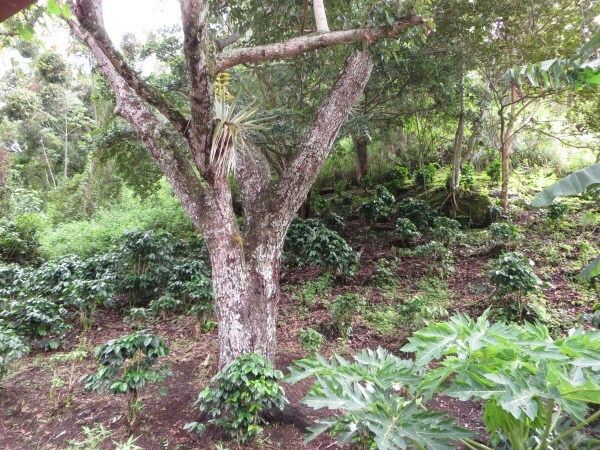 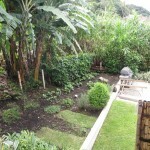 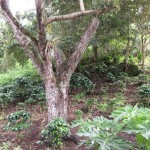 The gardens here have been well-cultivated with trees of lime, orange, avocado, banana and coffee. 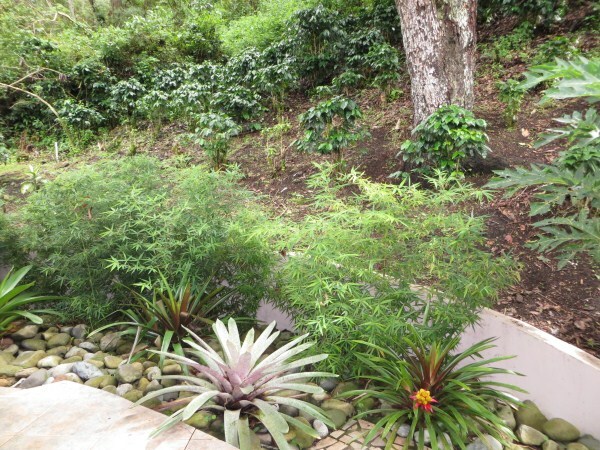 An existing herb garden adds to the spice of life in your new home. 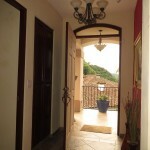 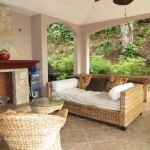 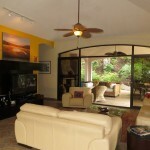 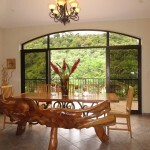 The large balcony just off the dining room/living room area has views of Volcan Baru and the Valle Escondido valley. 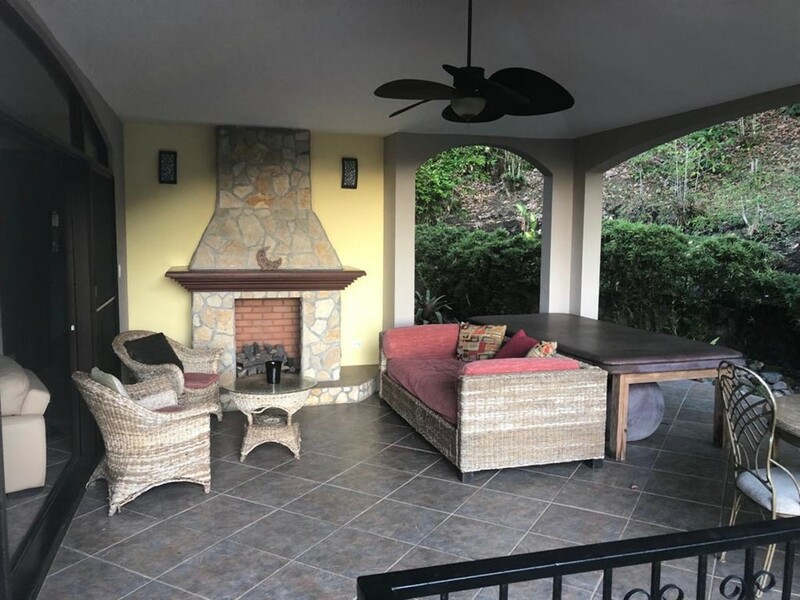 It is perfectly situated in the house to bring you easily accessible outdoor living all year-round in the comfort of your home. 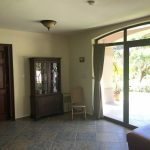 The lower level of the home has a separate entrance and its own smaller kitchen with living room as well as two bedrooms. 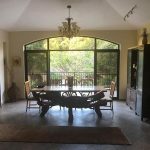 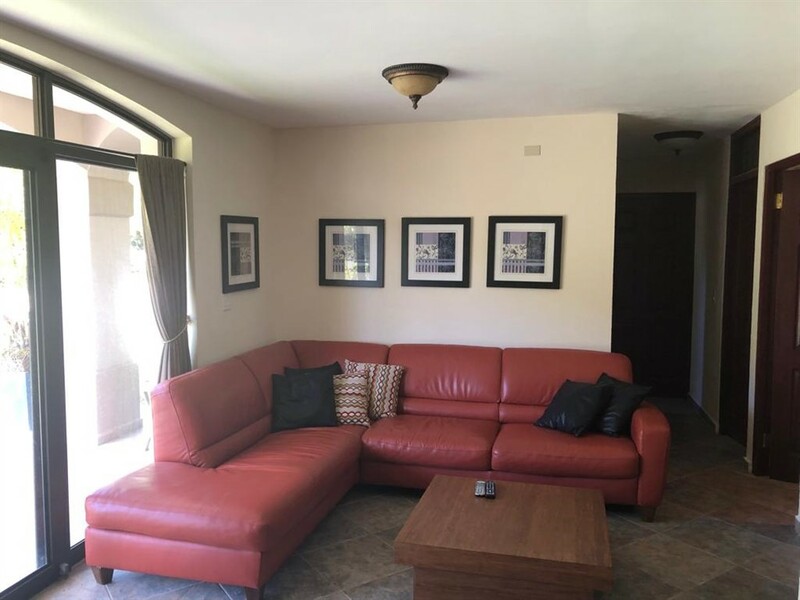 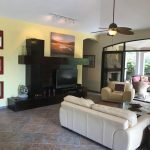 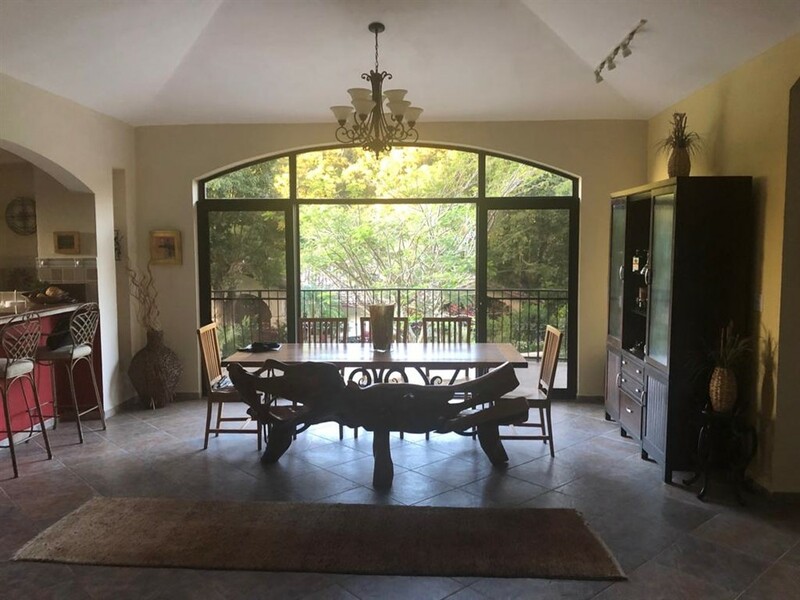 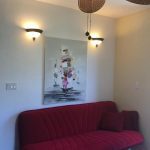 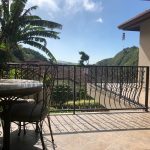 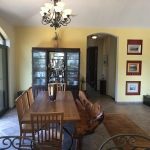 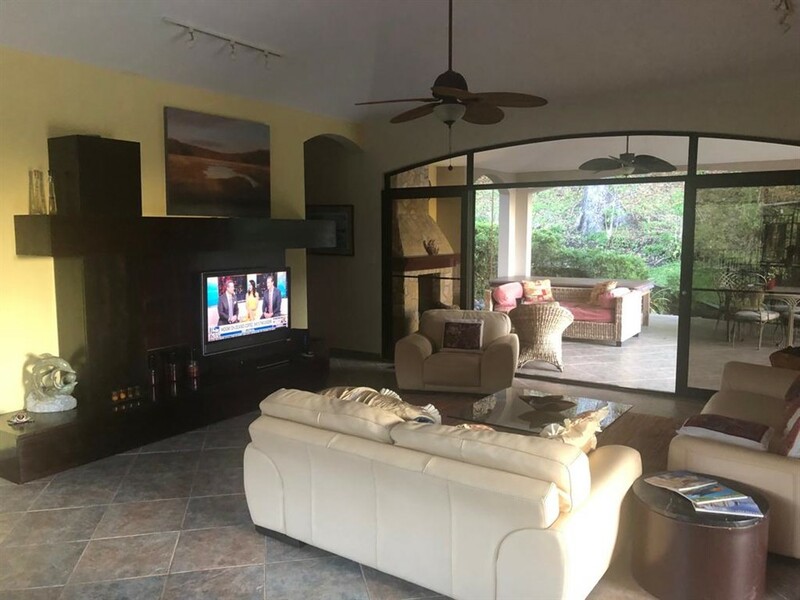 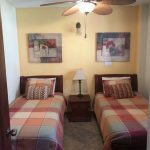 The entire lower floor apartment is a great rental lock-out providing extra income if desired and a great retreat for your guests or children. 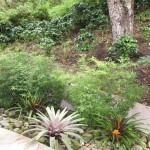 The lower floor opens to a perfectly manicured generous front yard. 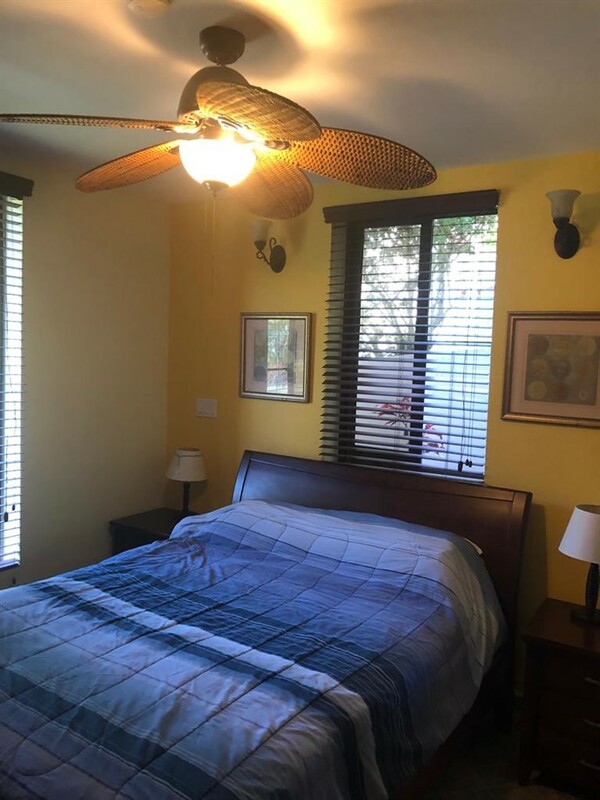 Other nice features include tropical style ceiling fans, spotlight lighting, granite countertops, large size ceramic tile floors, a rock garden, wrap around balcony, an extra room off the garage that is currently used as a gym, stylish blinds on the windows, walk-in closet, Jacuzzi style bathtub, glass shower doors, a large garage, and lots of nice built-in cabinets providing plenty of storage. 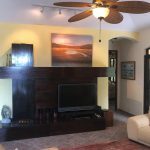 The property tax exemption passes to new owner. 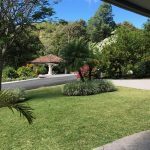 For extra peace of mind the home comes with a 10 kilowatt propane electric generator with automatic transfer already installed. 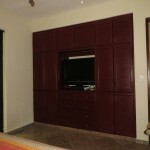 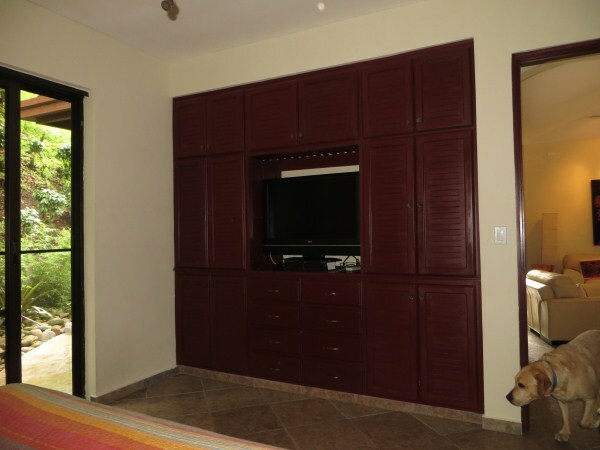 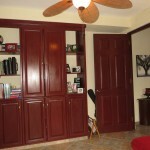 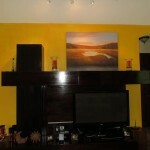 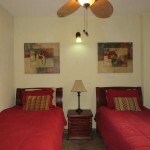 It also includes many furnishings including bedroom furniture and two flat screen televisions. 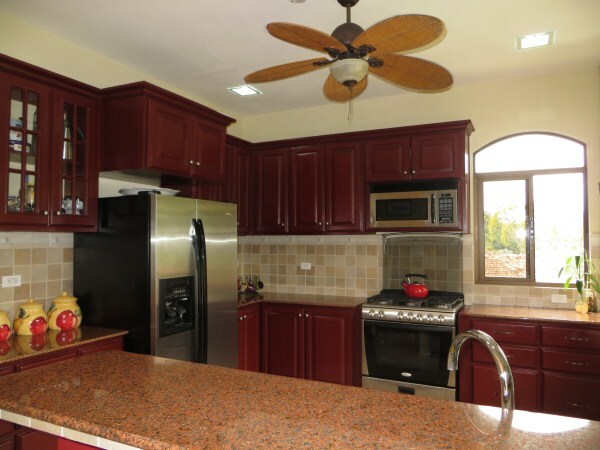 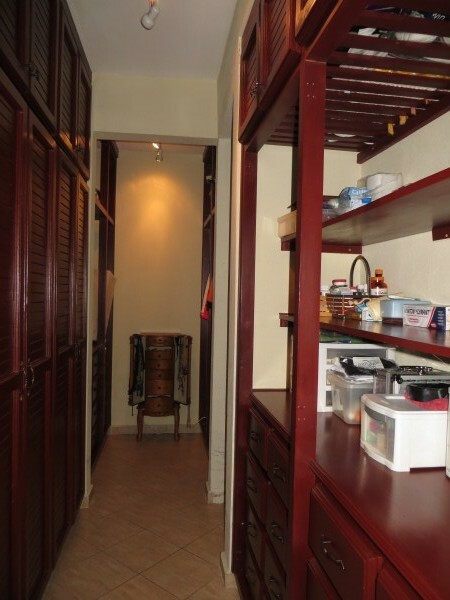 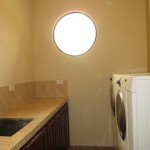 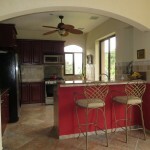 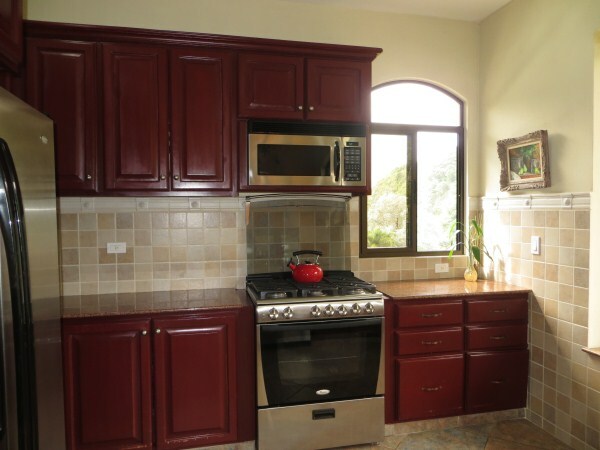 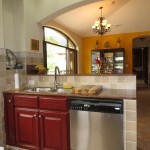 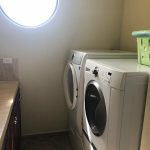 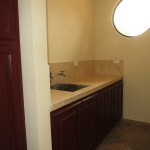 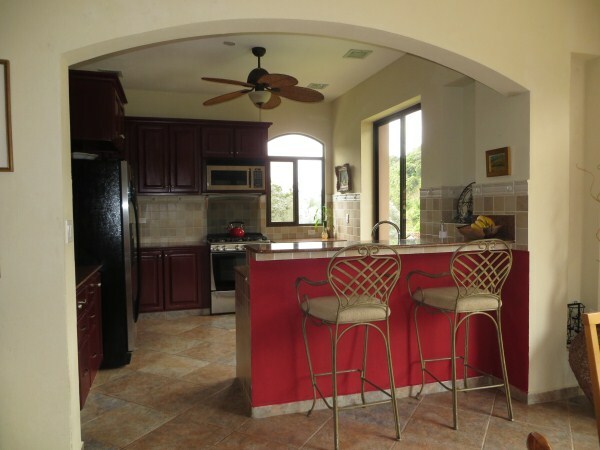 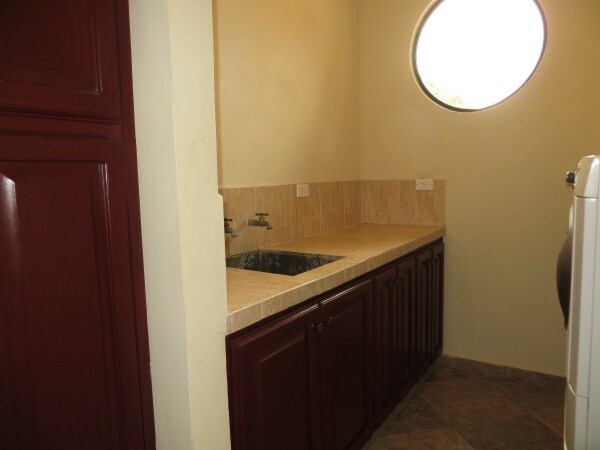 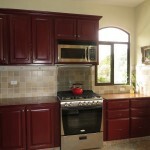 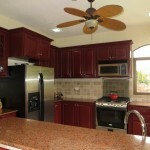 There are two kitchens of appliances – 2 refrigerators, 2 stoves, 2 microwaves and 2 washer/dryers are included too. 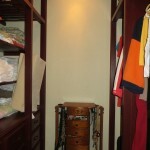 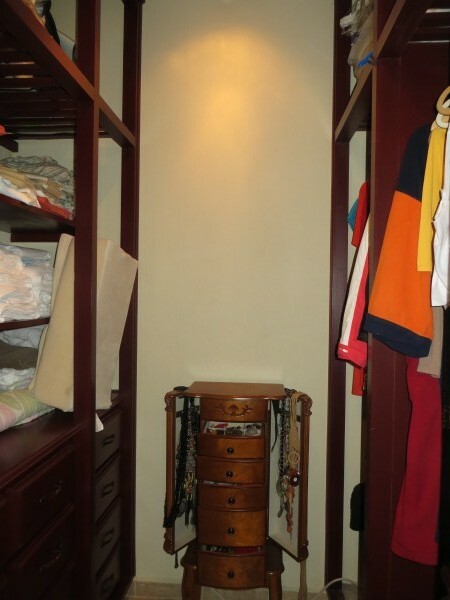 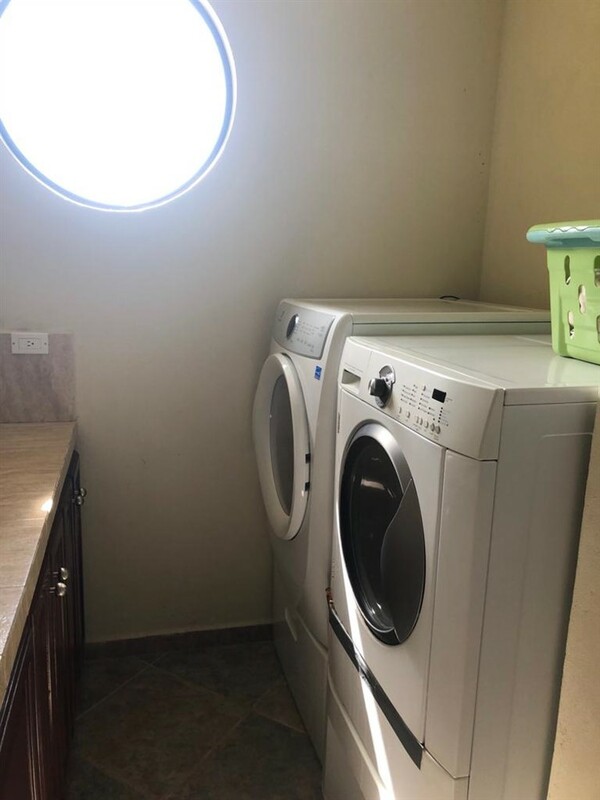 The house has a unique feature in a well-finished above the top floor room accessible by pull-down that most would use for storage. 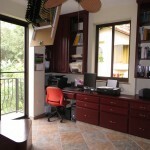 The costs to maintain the home are very modest. 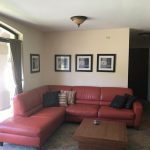 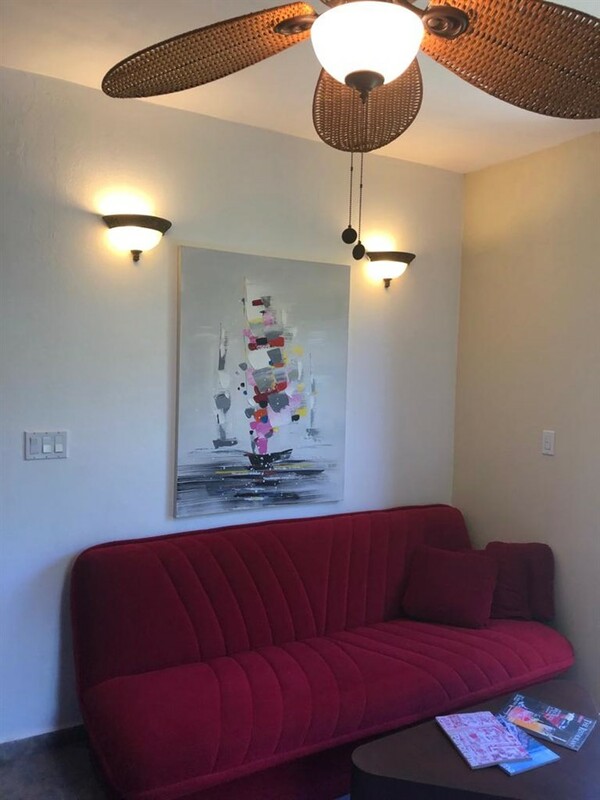 For a total of only $688 a month the owners enjoy knowing that all of these items are fully covered and more: weekly maid service, weekly gardener, electricity, propane, water, Home Owner’s association fees, country club dues, and even a $50 monthly spa/restaurant credit. 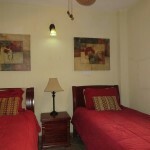 It is a high-end lifestyle at very low comparative cost. 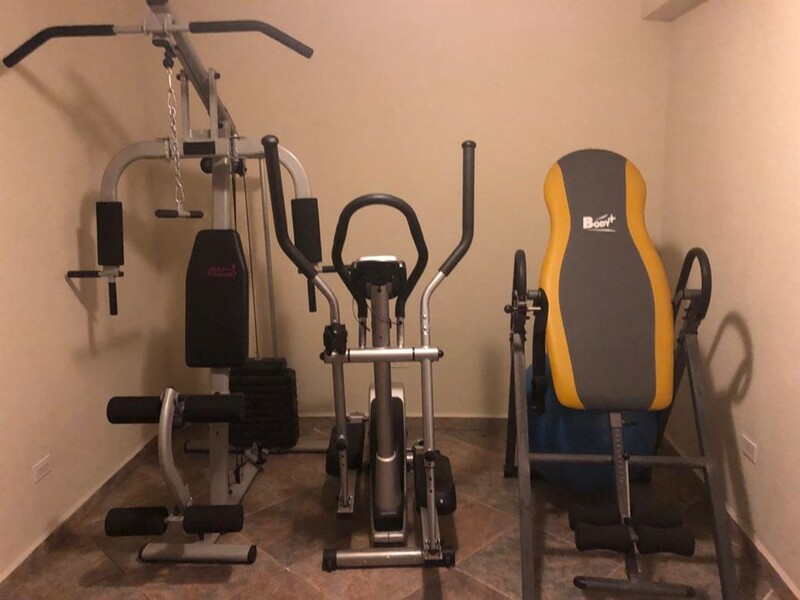 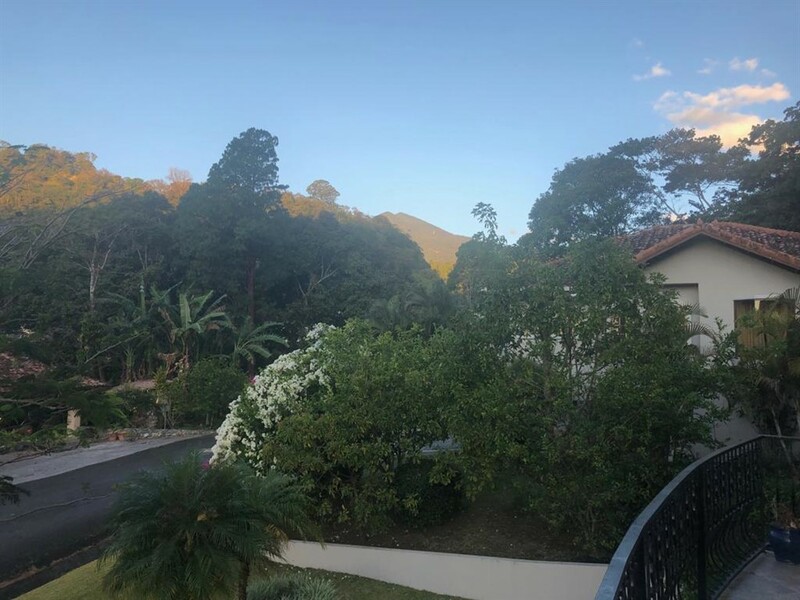 Enjoy the wonderful amenities of Valle Escondido with your country club membership that comes with the property – The spa, indoor swimming pool and fitness club are at your disposal. 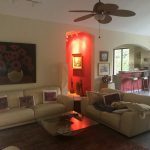 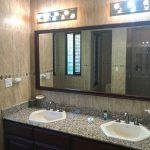 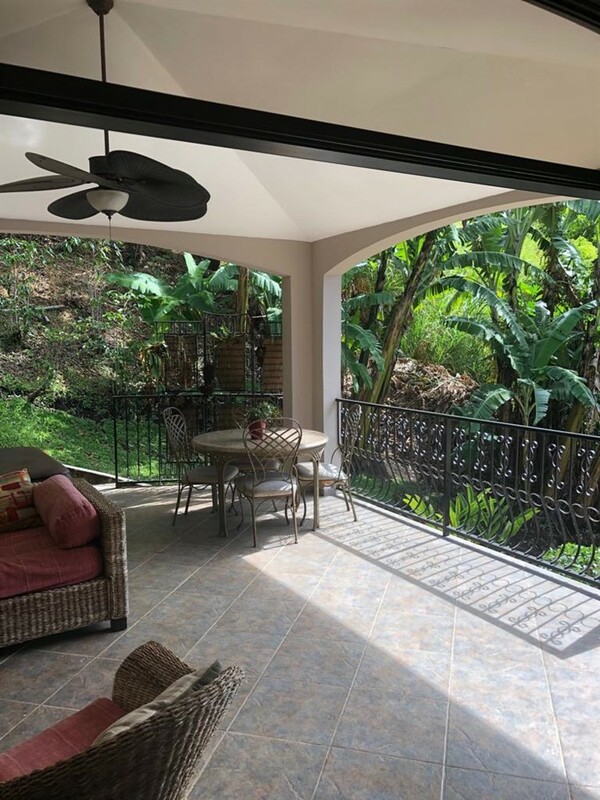 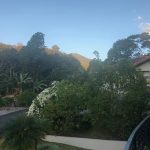 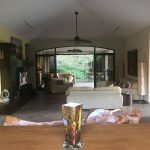 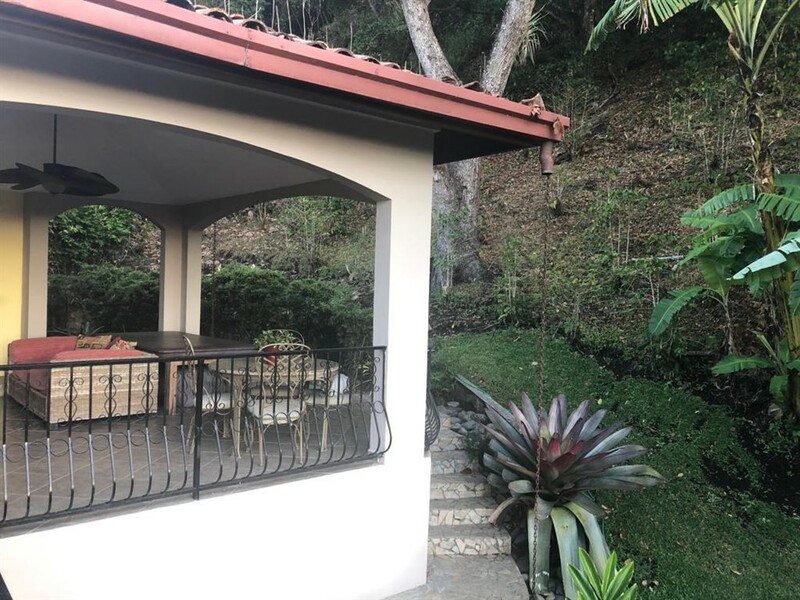 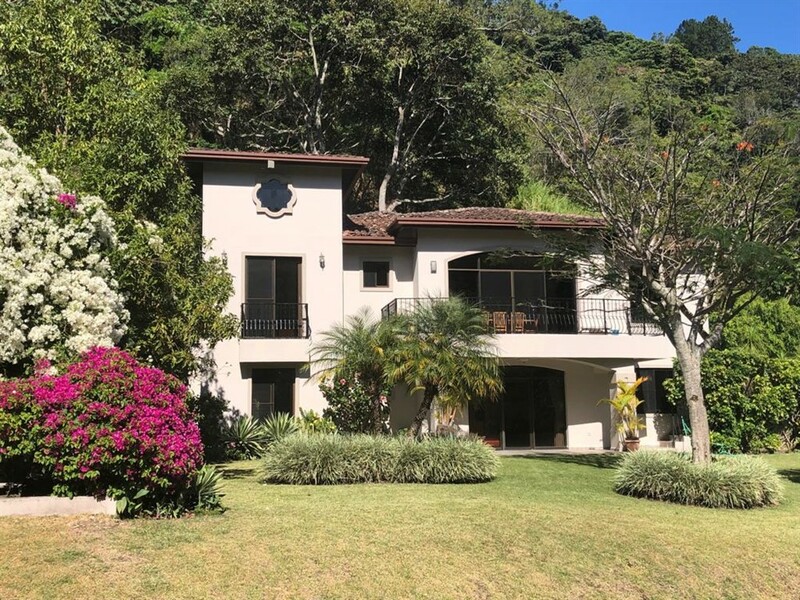 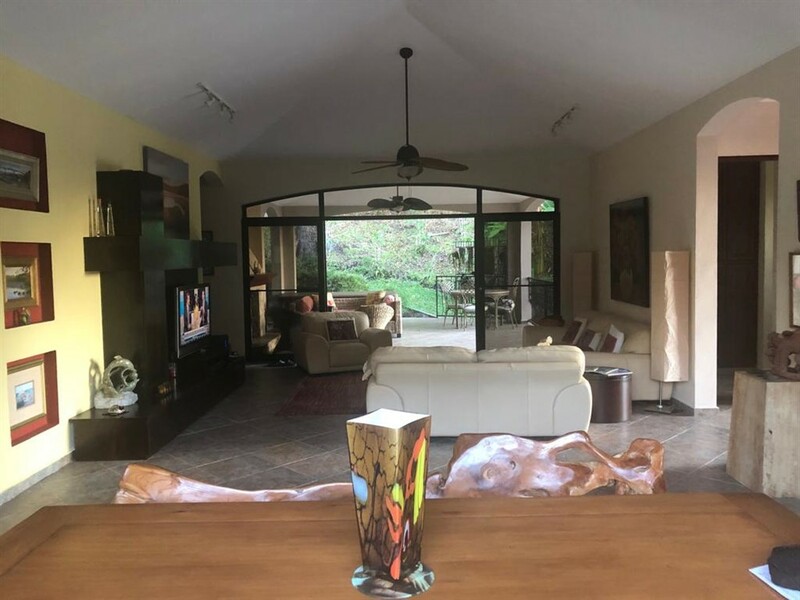 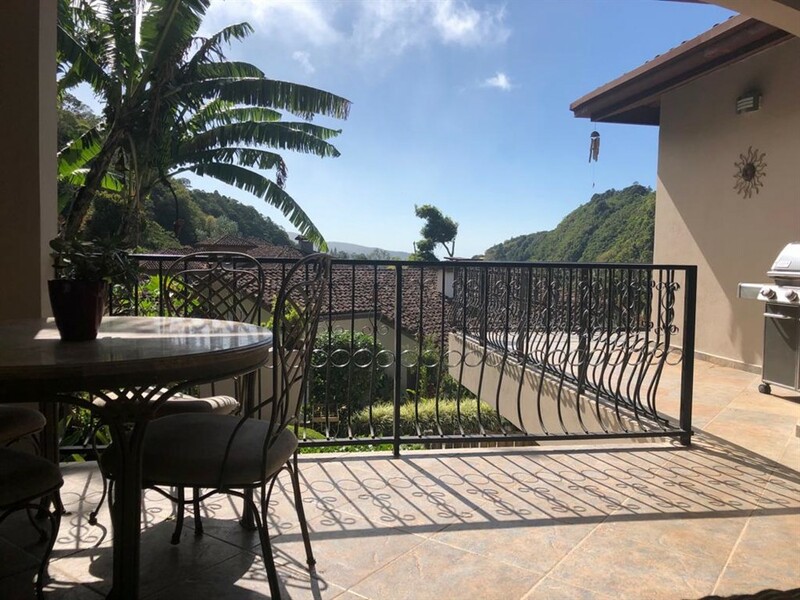 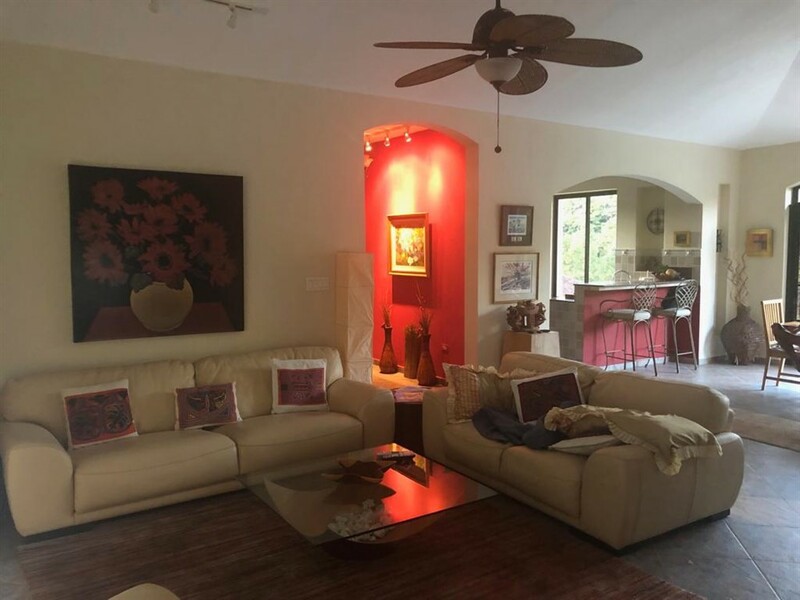 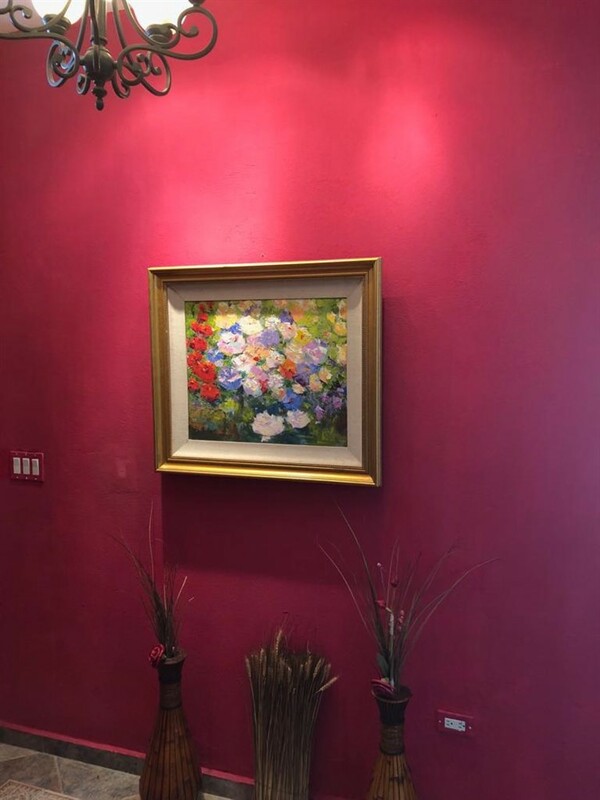 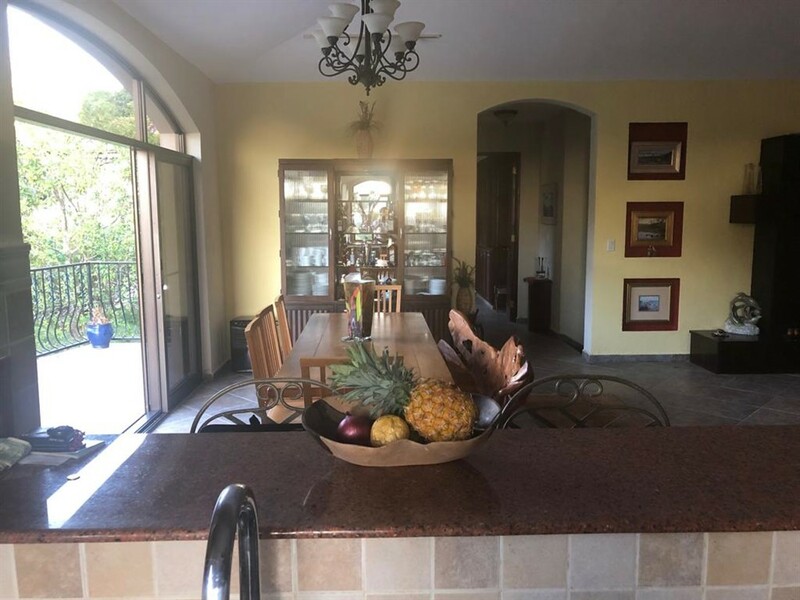 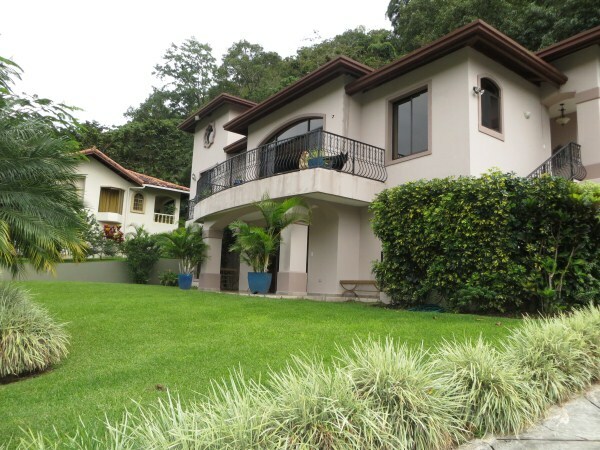 This luxurious house for sale is in Valle Escondido, the residential development credited as a major factor in starting the wave of expats coming to Panama for a better lifestyle. 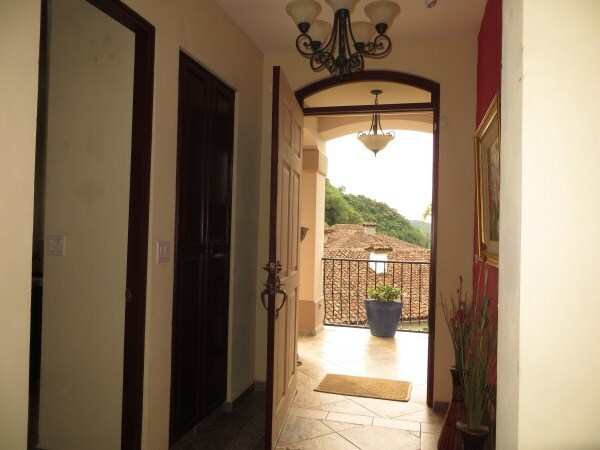 Valle Escondido boasts a gorgeous mountain valley close to a sweet and friendly town center in a secure, amenity-rich setting. 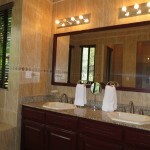 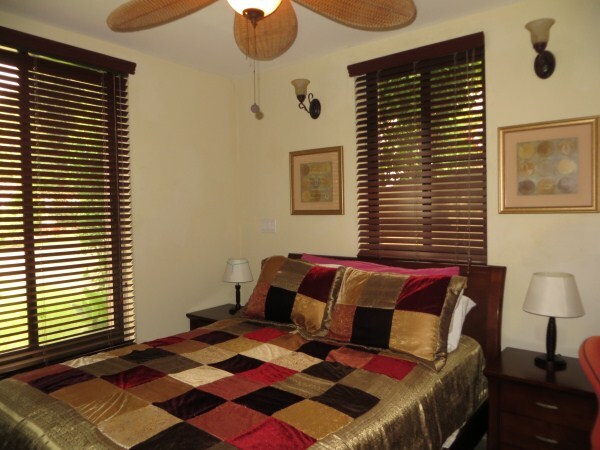 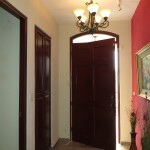 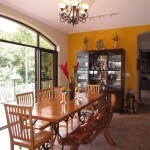 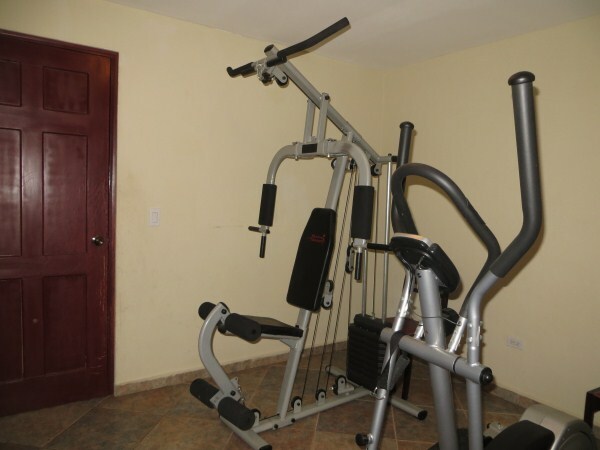 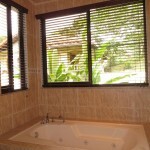 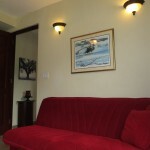 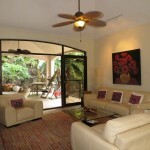 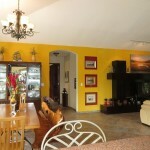 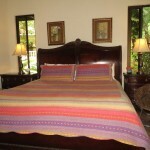 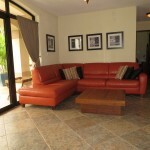 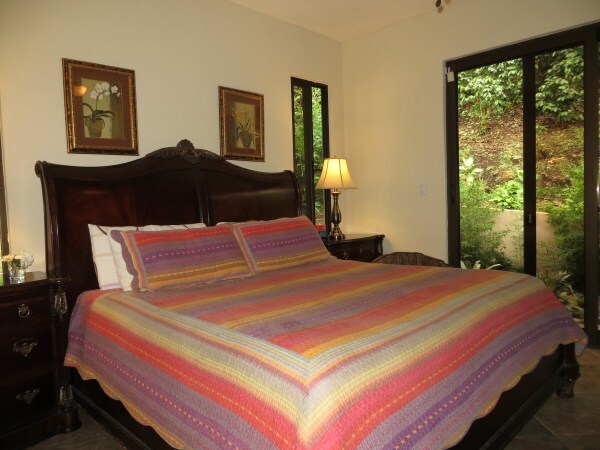 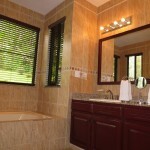 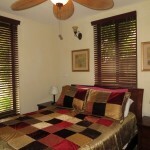 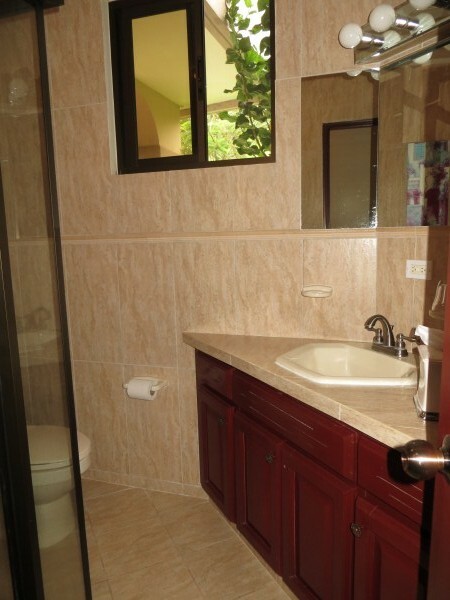 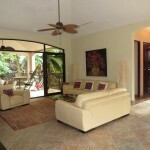 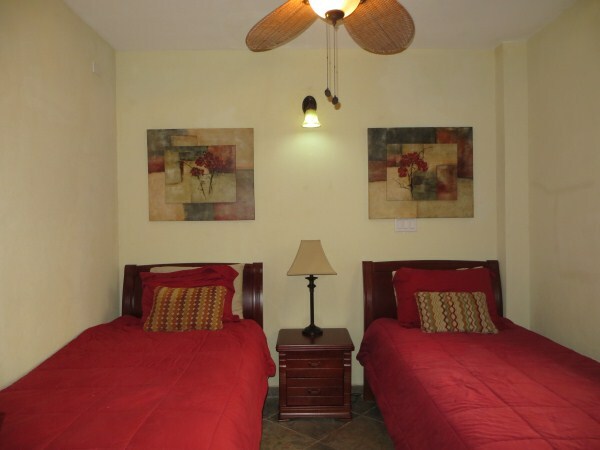 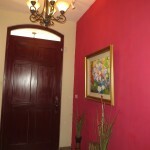 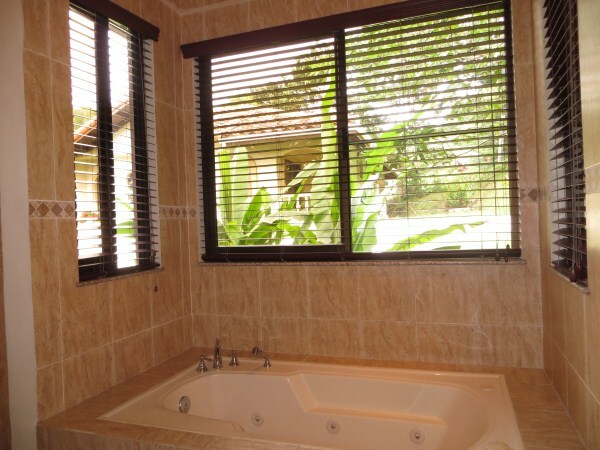 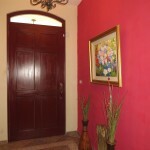 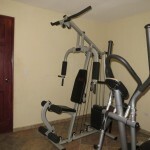 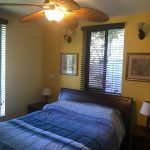 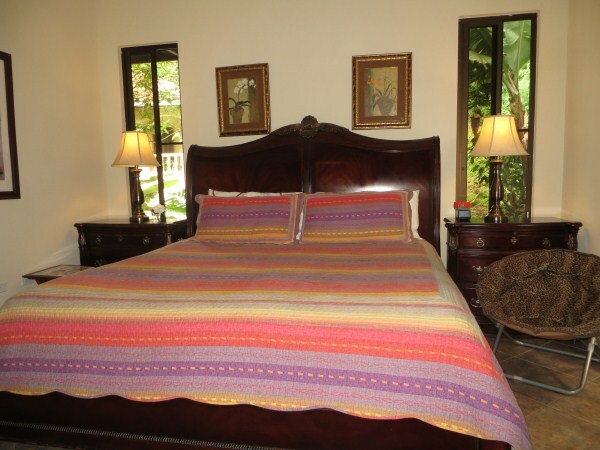 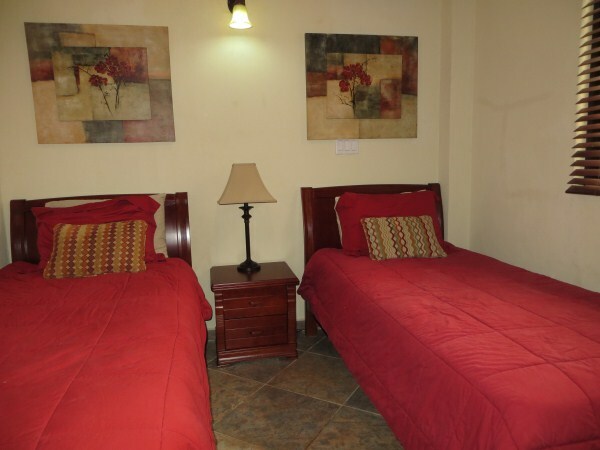 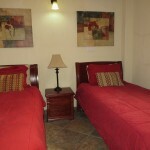 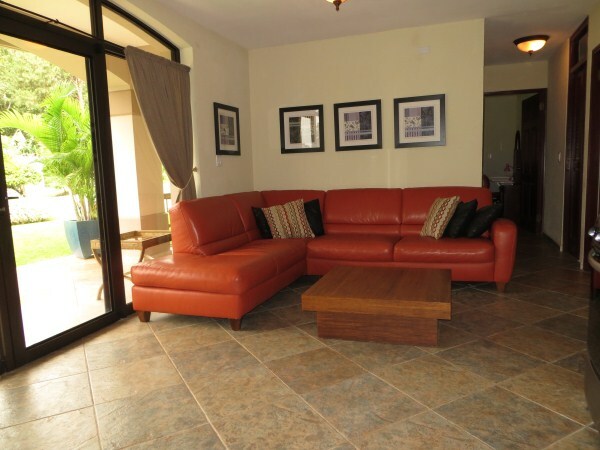 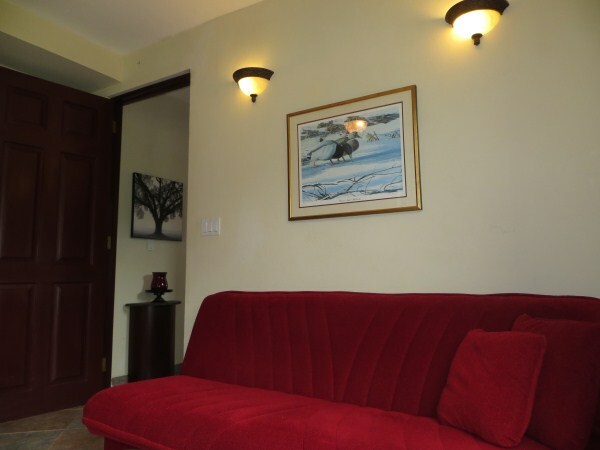 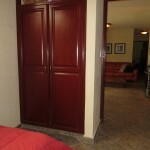 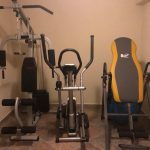 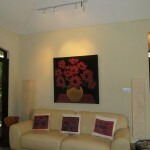 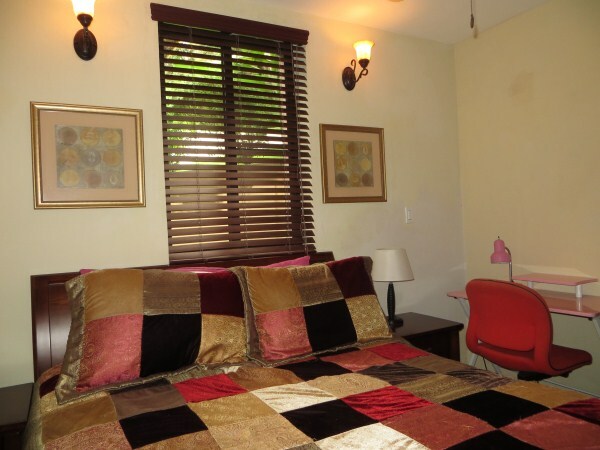 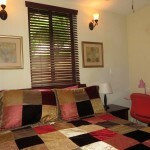 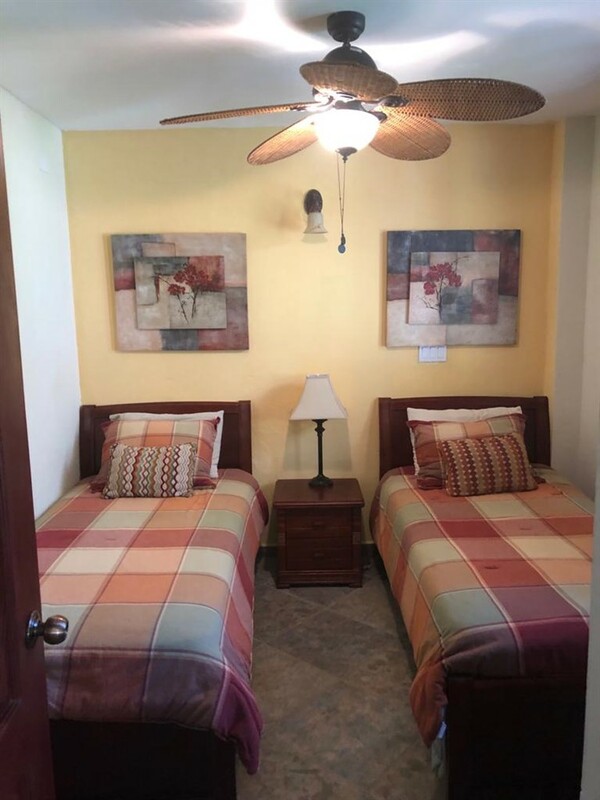 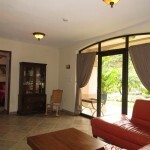 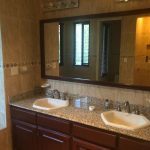 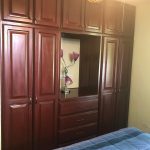 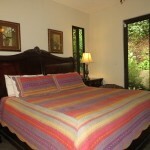 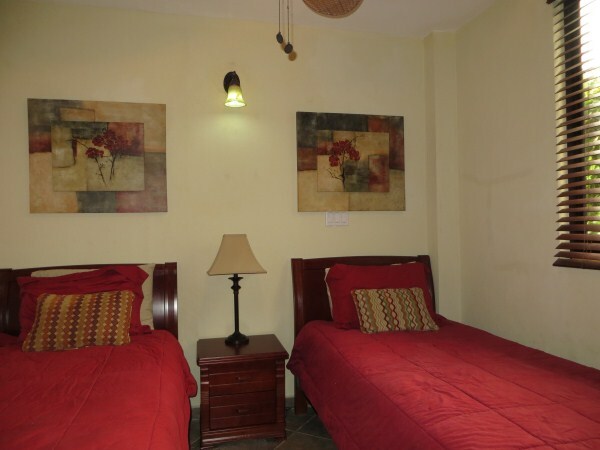 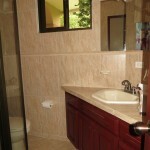 Rental option is fully furnished including gardener and weekly housekeeping. 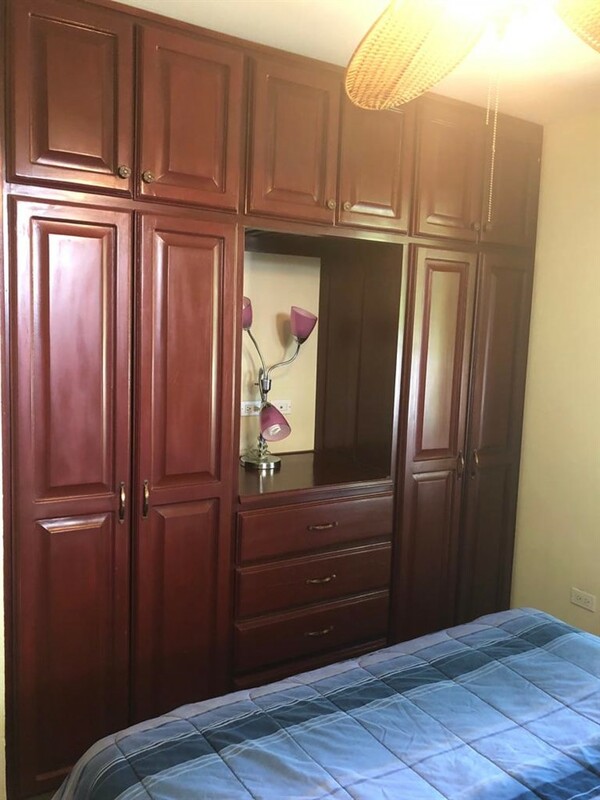 Descripción: Disfrute de esta propiedad ubicada en la lujosa comunidad de Valle Escondido. 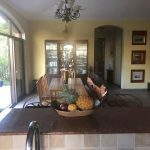 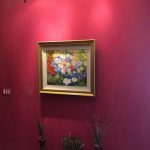 La casa fue diseñada con el fin de tener amplios espacios abiertos que se conecten con el interior de la casa. 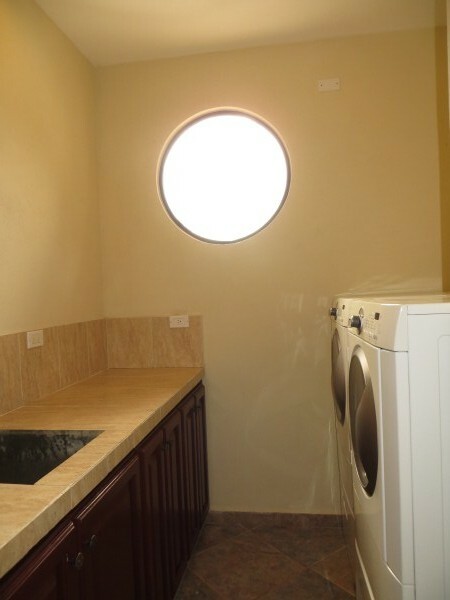 En el piso superior se concentran todos los espacios de la casa, ya que en el primer piso se creó un pequeño apartamento equipado con cocina línea blanca, un baño y una espaciosa habitación. 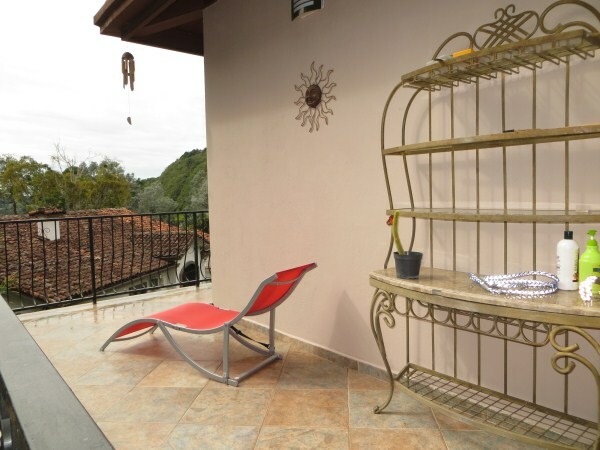 El piso superior tiene un hermoso balcón. 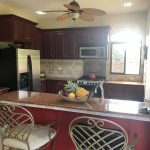 La cocina es espaciosa, con sobres de granito y muebles de madera. 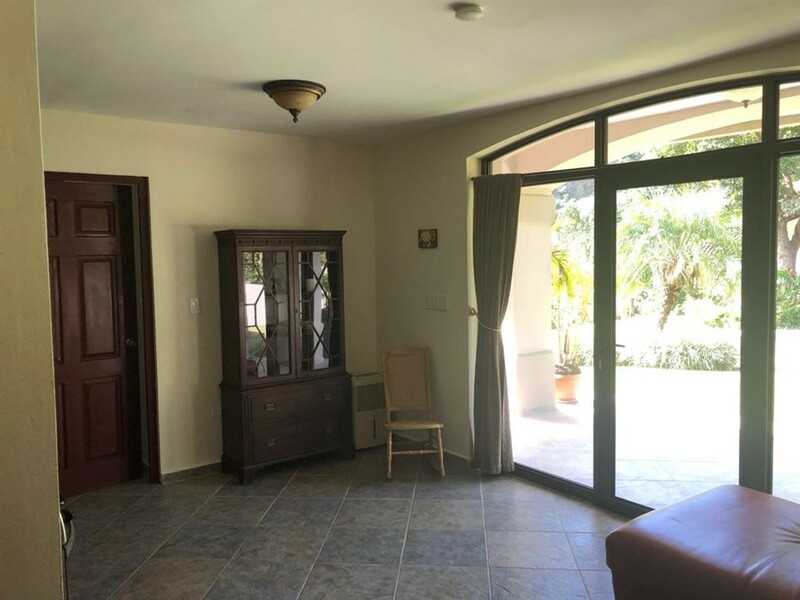 La sala y el comedor se encuentran en un solo espacio. 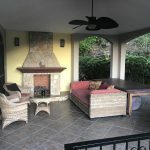 La terraza es espacioso y privada, tiene una pequeña chimenea y una acogedora sala completamente abierta hacia el patio trasero. 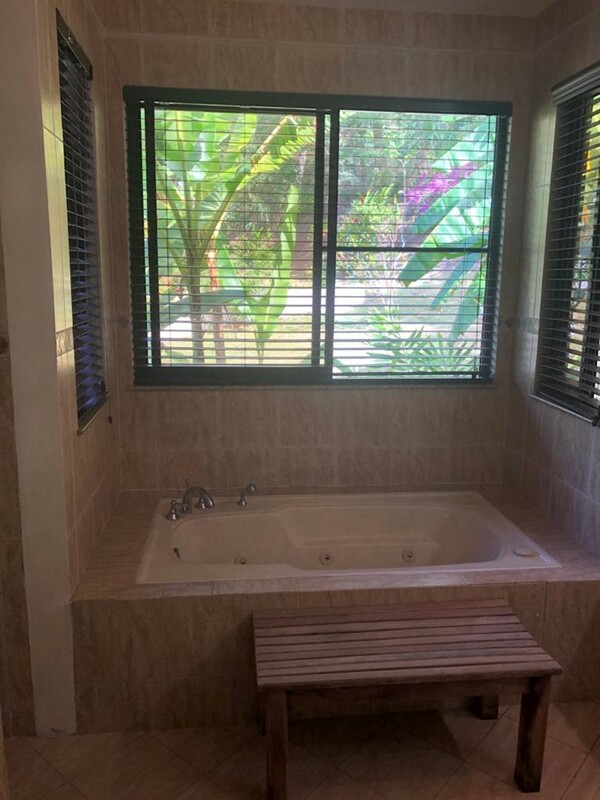 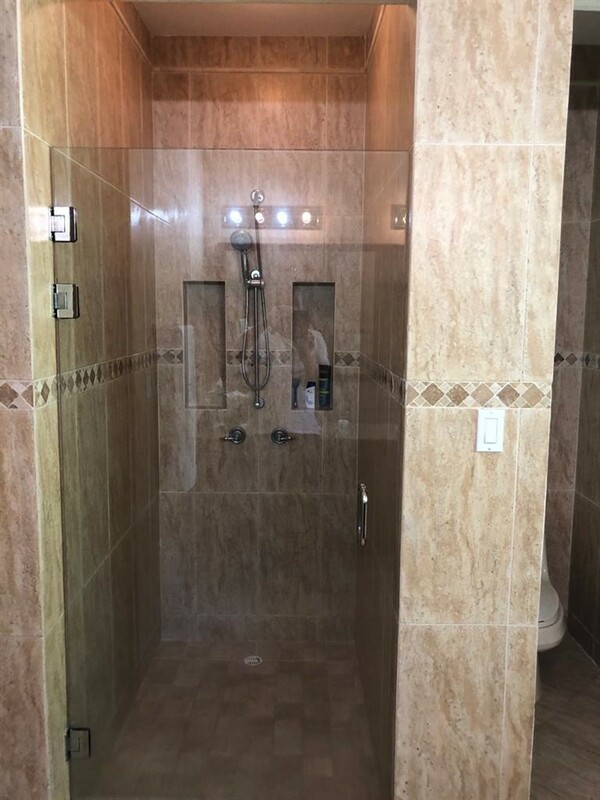 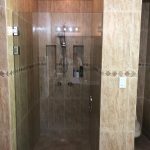 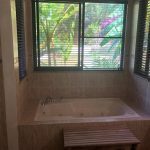 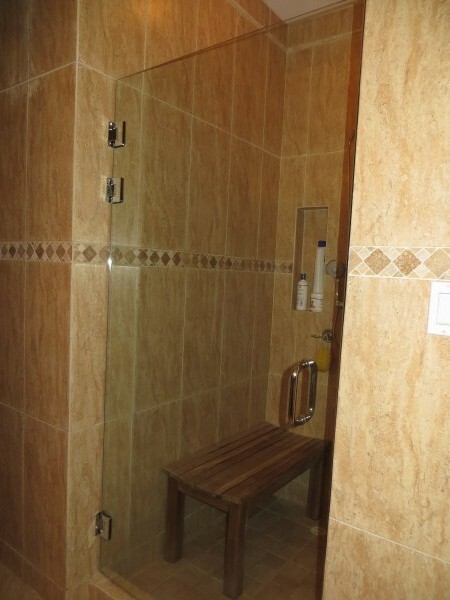 La habitación principal consta de amplias ventanas y un esplendido baño con bañera, ducha con puertas de vidrio y lavamanos doble con sobre de granito. 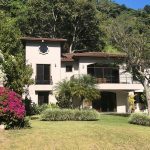 Esta propiedad incluye exoneración de impuestos y es transferible a el futuro dueño. 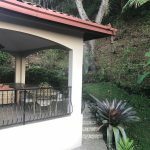 Acompañenos a ver esta lujosa propiedad.